CG Says: The Ram 1500 half-ton pickup is redesigned for 2019, gaining a host of new high-tech safety and convenience features, a lighter body structure with enhanced aerodynamics, and new powertrain technology aimed at improving fuel economy. Initially, the 2019 Ram 1500 will be available as a Quad Cab (an extended cab with abbreviated rear doors) and Crew Cab (a full 4-door cab with full-length rear doors); a “regular” two-door cab will be added later in the model year. The previous-generation 1500 will continue for 2019 as the Ram 1500 Classic (see separate review). The 395-horsepower 5.7-liter Hemi V8 returns, and is joined by “eTorque” mild-hybrid versions of both the Hemi and a 3.6-liter V6. The eTorque system uses a 48-volt motor/generator in place of a traditional 12-volt alternator to provide quick start/stop capability and a bit of increased low-end torque for better acceleration, as well as improved fuel economy. A turbodiesel 3.0-liter V6 is expected later in the model year. All engines are paired with an 8-speed automatic transmission, and as before, part-time and full-time 4-wheel drive systems are available. The new Crew Cab body is four inches longer for increased rear-seat legroom. Available comfort and convenience features include heated/ventilated front and rear seats, parallel park assist, surround-view camera, Apple CarPlay and Android Auto functionality, 4G Wi-Fi hotspot, power-adjustable pedals, panoramic sunroof, and power release tailgate with hand-swipe feature. Available safety features include forward collision warning and mitigation, front and rear obstacle detection with automatic braking when in reverse, blind-spot alert, lane-departure warning, rear cross-traffic alert, adaptive headlights, and adaptive cruise control. The Ram 1500 has long been a Consumer Guide Best Buy, and the new generation is an impressive revamp of an old favorite. Ram’s unique coil-spring rear suspension provides an exceptionally smooth ride and composed handling for a pickup. 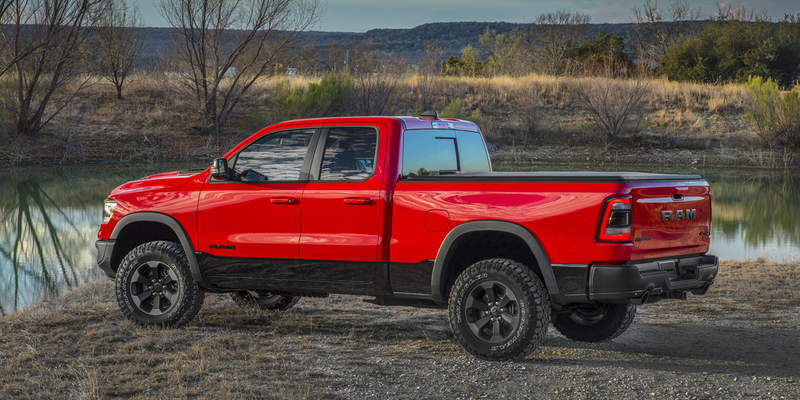 The Hemi engine is as powerful as ever, but its fuel economy is still subpar even by large-pickup standards; although the V6 does better and the forthcoming diesel engine should be even better still. Even with a thirsty Hemi, the Ram 1500 is an outstanding truck that deserves a look.